Last reviewed 13-Mar-17. Incorrect? Let us know. See Accessibility on the UBC Transportation website for additional information and assistance. 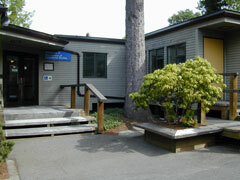 (1) The main entrance to Ponderosa Annex G is located on the south side of the building near Ponderosa Annex H. This entrance is inaccessible due to stairs and has a manual door. (2) The second entrance is located at the rear of the building on the east side. This entrance includes a ramp and is level and accessible with a manual door. Use the driveway from Lower Mall to access the ramp to the accessible entrance. None. This building is fully accessible. Ponderosa Office Annex G is located near the red arrow on the map below. You can plot a second location below. Create Your Own Map: You can create your own printable map – view instructions. To find a different location, click anywhere on the map or start a new search. Finding Your Way: Ponderosa Office Annex G is located on the east side of Lower Mall across from Place Vanier Residence and behind the Ponderosa Centre. Detailed Directions: A road map and detailed directions for Ponderosa Office Annex G can be found on Google. Use the search function below to find and highlight a second location with an orange arrow on the map above (the red arrow will indicate the first location, Ponderosa Office Annex G).